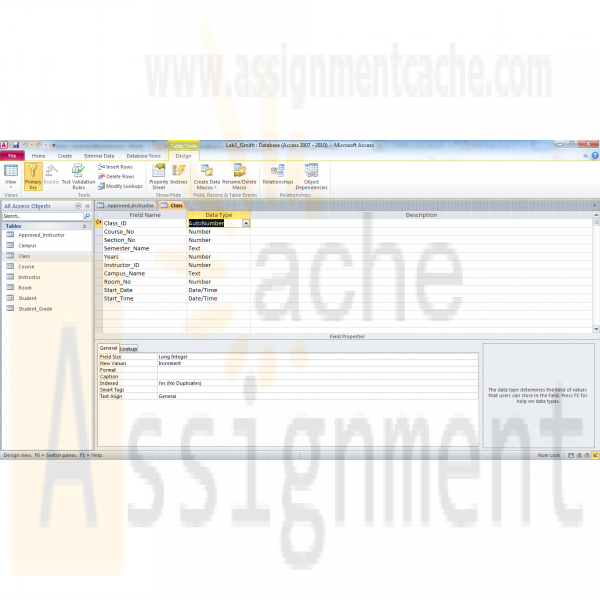 In this assignment, you will learn to create an Access database from a given ERD. To complete this assignment, you will need to be able to run Access 2010, either through Citrix or installed on your workstation or laptop. Name your Access database file using Lab3_, your first initial, and your last name (e.g., Lab3_JSmith.accdb). Create and save your Access database file. When you are done, submit your database to the Course Project Dropbox. Review the ERD below to understand the entities, attributes, primary keys, and relationships that you will create in your Access database. • Select the blank database icon in the main window. • Save the file with a name containing Lab3_, your first initial, and your last name (e.g., Lab3_JSmith.accdb). In Citrix, you will need to click the computer icon in the Save As window to see the different drives. Be sure to save the file to a local drive so it will be on your workstation. See the tutorials above for instructions on how to perform the following steps in Access 2010. Add tables to the Access database. • Add a table for each entity listed in the provided ERD diagram. • Add a column for each attribute listed in the provided ERD diagram. • Select a primary key for each table as indicated in the provided ERD diagram. • Dates should have a date data type. • Surrogate keys should be autonumbered. • Numeric data should have a numeric data type. • Character data should have a character data type. • Selection Relationships under Database Tools. Move all your tables into the Relationship window by dragging them in or by using the Show Tables pop-up window. 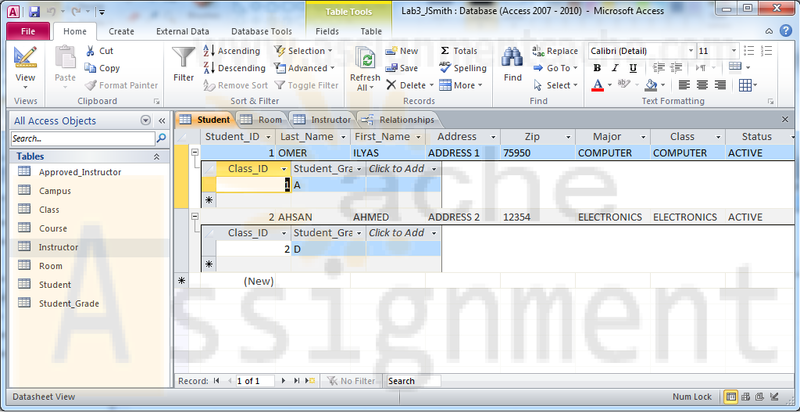 o Add the relationship between the tables in your database. o Enable referential integrity on the relationship. o Enable cascade updates on the relationship. Add at least two rows of data to each table in your database. Use any values you like for each of the columns. Remember that you must add data to parent tables before adding data to child tables, because referential integrity is enabled. • Student first and last name cannot be a null value. • Course credit hours must be between one and four. • Course name must be unique and cannot be a null value. • Instructor first and last name cannot be a null value. • Grade must be one of these values: A, B, C, D, F, I, W, or E. W signifies withdrawn and E signifies enrolled. When you are done, save the file on your local hard drive and upload it to the Course Project Dropbox. Your file should have the following filename format: Lab3_FirstInitialLastName.accdb. For instructions on how to copy files between the Citrix server and your local machine, watch the iLab tutorial, Copying Files from Citrix, located in the iLab menu tab under Course Home.